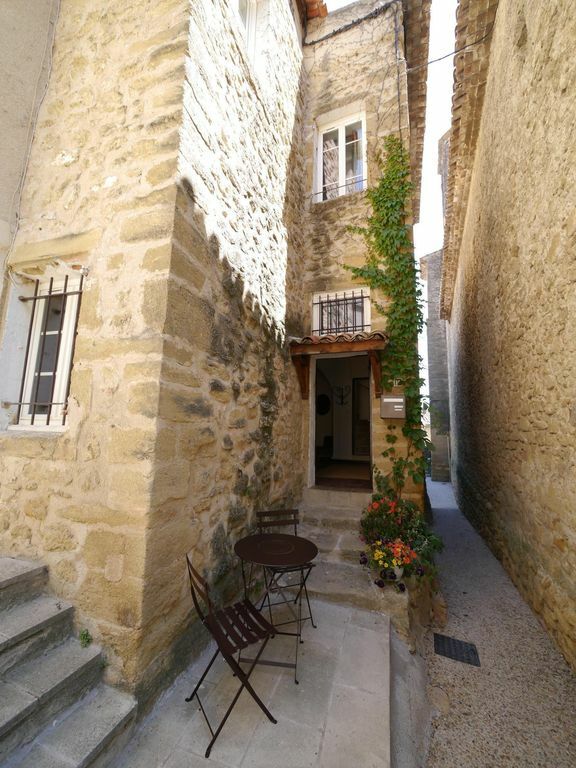 Village house for 8/9 people near all shopping facilities in Luber, Provence. 3-storey house of 120 sq.m, 4 bedrooms, 2 bathrooms, Internet access. This 3-storey 120 sq.m house can accommodate up to 9 people in an original and charming environment. It is a part of a very recently renovated old priory (ongoing layout). The ground floor, with vaulted ceilings, includes a vast 32 sq.m dining room, an equipped kitchen, a laundry and a small 8 sq.m living room that can be used as a single room if needed (mobile dividing wall). A stone staircase directly carved into the rock (the same rock on which our beautiful village is perched) will take you to the upper floors of the house. On the first floor you can find a 10 sq.m double bedroom, a bathroom with toilets and a large 30 sq.m living room that can become a bedroom with 3 beds thanks to the mobile separating walls. On the second floor you can find a bathroom with toilets and a triple bedroom with a relaxation area in a mezzanine. As the house benefits from the thickness of the ancient walls, and thus keeps a pleasant temperature, it is not air-conditioned (except for the room on the second floor as it is under the roof). The gite is equipped with a dishwasher, a washing machine, all the equipment for ironing and cleaning, two hairdryers, and a mini hi-fi stereo system. Equipment for young children (travel cot, high chair, safety car seat, pushchair, etc.) available upon request. Lauris is a perched village in the South of the Luberon. Because of its special location, overlooking the Durance valley and preceding the typical mounts of the Luberon, its atmosphere and environment are absolutely unique. My husband and I fell in love with this place 10 years ago. One year ago, I had the desire, and the opportunity, to restore this house, which is a part of the village's old priory. I wanted to give it a new life, and to make it an informal and inviting place. If, like me, you are a lover of Provence villages and their typical stone houses. If you care about nature, if you like arts exhibitions and artistic atmospheres, and if you wish to discover the region in a more authentic way, then this house is for you! This year is its first season. I will open its doors from the 7th of June until the 26th of September, 2014. After that, I will keep it lively through my Creation Workshop. And, as I want to make people discover some of the talents in our beautiful region, I will organise themed parties and exhibitions in the house. This house is a rebirth for me and I hope it will be the perfect holiday place for you. Situated under the Church's stunning wrought-iron campanile, this house doesn't have a pool, nor a garden, but it will welcome you with all the simplicity and warmth of houses of the old times. With its large vaulting, its fireplace in the centre of the living room, its stone staircase directly carved into the rock and its secret nooks, this house is a true haven of peace and inspiration. Located in the heart of the historical area of Lauris, where there is almost no traffic, this house is peaceful yet close to all the shops and the village's hustle and bustle. Its 120 sq. m, its 3 floors and its 9 sleeping arrangements make it the perfect place for family gatherings or for holiday with friends. You can park your car for free either on the place of the church or in the parking spots nearby. Both bathrooms are equipped with a hair dryer. 4 bathmats, 4 tea towels, 4 hand towels, 1 apron. Duvets and pillows. The bed and bath linen is provided upon request depending on the number of people and of the number of beds that will be used. Available upon request See the terms with the owner. There are two living rooms. A little living room on the ground floor and a large one on the first floor, depending on the number of people. A baby high chair is available upon request. We stayed at Gaelle's place for 1 week and found it all fantastic. The house, surroundings, the whole area and Gaelle herself. She was very kind and attentive. Just a perfect vacation! The village of Lauris is very quaint, with picturesque scenes and a lovely view of the valley from the Chateau. Our host, Gaëlle was very helpful and kind. She gave wonderful recommendations and had a stash of toys for our 2 year old to play during our stay. We felt at home in her simply, very chic decorated place. My family and I spent two wonderful weeks in this beautiful house in Lauris. The house is within walking distance of stores and near the Lauris Chateau. The owner is a terrific host. She is very responsive and attends to her clients with great care. If you are looking for an experience of living in a village in the Luberon, I would highly recommend renting this house. La maison de Gaëlle LEJARS située au centre de LAURIS est accueillante et bien équipée et décorée avec goût : elle est agréable à vivre même en hiver pour six adultes avec enfants. Elle ne manque de rien. Sa propriétaire est très attentive et attentionnée pour ses hôtes. Si je devais à nouveau séjourner à LAURIS je n’hésiterai pas à reporter mon choix sur cette adresse. Une propriete au coeur du village, dans laquelle nous y avons passé un agreable sejour. Le logis est à l'image de sa proprietaire , il est elegant. Eine sehr schöne FeWo in der es an nichts fehlt. Es ist ein altes Haus, das sehr liebevoll restauriert und eingerichtet wurde. Wir haben uns außerordentlich wohl gefühlt. Lauris is a perched village typical of the Luberon natural regional park. At the foot of the village, you can easily enjoy hiking, cycling, and horse or donkey riding. The river La Durance passes 500 meters away from the bottom of the village. It is the perfect place to enjoy really refreshing moments or to watch the surrounding fauna and flora. You can also go for beautiful canoe rides. There are several lakes less than 10 minutes away from the village. Furthermore, Lauris has the advantage to be situated at the intersection of some of the major roads of the PACA region. This will make your visit of the surroundings and of the region a lot easier. You are 30 minutes away from Aix-en-Provence (Monet's town), from Avignon (famous for its festival in July), from Fontaine-de-Vaucluse, and from the La Barben's zoo. Nos tarifs de location comprennent la fourniture de l'ensemble du linge de maison et les charges.